Earlier, I am not aware of the how and why in relations to the selection of Hot Members at MyBlogLog. At this moment the When, Who, and Where, I know for sure. Yes!! I am one of the Hot Members at I ranked 9 times. I prefer not to ask individuals at MyBlogLog about this. Or other individuals who may know. This is because I love MyBlogLog, and I prefer to spending almost every precious moments here at this my home page at MyBlogLog. I am always on. In addition I just be my self, doing my own passion, and be in touch with all the nice people; individual or group bloggers at MyBlogLog. This is an honor for me. I thank each and everyone. All who have been contributory to the hot members position I am given at MyBlogLog. There are moments I prefer to be silent, or say it in a manner of a gentle art of oratory. Yet, there is a proper usefulness in shout. Each has its own merit and its suitability to the context I am in during a particular moment. To me a friend pointed out why are individuals speak so loudly that I cannot hear them. Of course as one who is master in communication, I say there is a way to shout using technology such as Shoutwire.com. I have just joined after my registration has been approved. The procedure is so simple, and being ease with speed. Now I can shout what and in a manner I know best. And then we have Zubli from the Book Writing Project, who also authors Who Is Zubli Zainordin, and Your Wisdom of Total Happiness. Zubli is one of the most endearing people I have met since I began blogging. I didn’t find him, he found me. If you’ve already met Zubli, you’ll understand what I’m saying. There is a lot more to him than meets the eye. Zubli is an incredibly intelligent person whose professional history will blow your socks off! He continually strives to bring exposure to those he meets without asking for anything in return. Zubli, this is my way of finally being able to publicly say THANK YOU for being YOU and bringing some recognition back to you. Only a special individual such as her can see specialness in others. I am truly touched by her touching. What can we say about Zubli? He has been very active here at MyBlogLog, and, he is a vivacious, mentally challenging and stimulating man. He has made my mind rethink many things since our first contact, and, he is always challenging me for my own good. Your Wisdom of Total Happiness …. Zubli likes to make people realize and reach their full potential. He is nothing more than a person who takes the time to seek and find those who inspire him and/or may need inspiration. I admire his great personality, which he shares freely with the world. – Best Student (Broadcasting) January June 1980. – Best Student (Broadcasting) July December 1980. – Best Student (Broadcasting) 1981. – Best Student (Mass Communication) 1978 – 1981. – Rank Among the Top Students (ITM) 1978 – 1981. – Young Lecturer Scheme 1982 – 1983. – I am also known as Raja Seni (The King Of Arts). When I started blogging I have never thought of receiving awards. I do what I love and I love what I do. Then one after another do I received. These awards is more a responsibility than any emotions that are natural to me as recipient of these awards. I also prefer to give awards. Personally I give in honor *Another Blogger’s Choice* Award. The God willing, more I can do awarding super bloggers who position superb blogs and are passionately blogging with integrity. A moment ago I received a certificate for participating in the INSKEN Trainers and Service Providers Seminar. 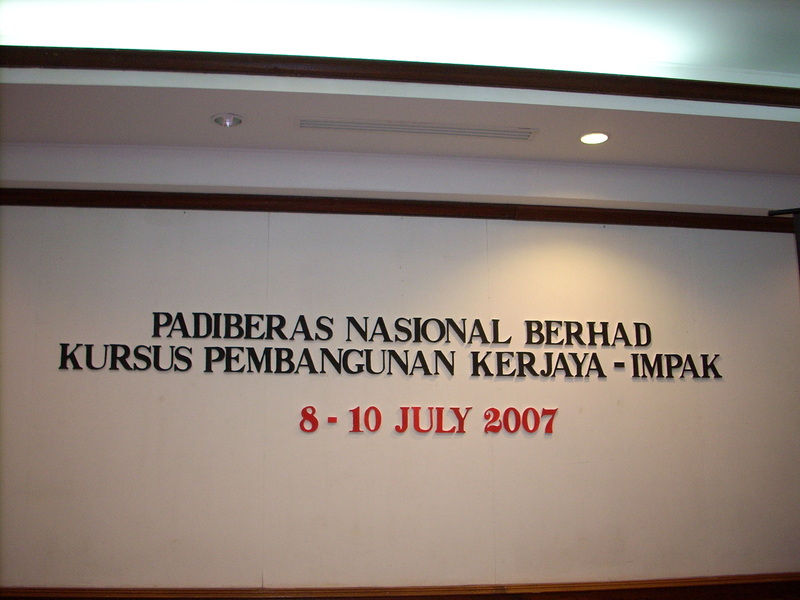 INSKEN is Institut Keusahawanan Negara or the National Entrepreneurial Institute. The opening, seminar, workshop, resolution presentation, and closing, excellent I say. Salute to the organizer. Out of the four workshops I say the D Group on Exploring Strategic Areas To Fulfill the Needs of the Industry, has achieved a class of a presentation. Well done. Others may have been deserving, should the art of gentle oratory has been exercised by each mandated with the responsibility of the presentation. As usual the resolution topic on Enhancing Graduates Involvement in Entrepreneurship, I am excited, so much so, immediately after the last word said by the Chairman, I am already at the microphone at the floor positioned for the audience. For a country like Malaysia it is not so nice through her ministries and agencies to be applying an approach that is reactive. Possibly, it is better, to be responsive. Please ponder on the topic prepared in this particular one in this seminar. Mempergiatkan Penglibatan Siswazah Dalam Keusahawanan, or Enhancing Graduates Involvement in Entrepreneurship. Let us suppose, the topic instead is: Graduates Leading Malaysian Entrepreneurship from Local to Global. This topic is not a selection here. Because of our definition of Education from the word educe – to draw out from within rather than to pour in from without. Education is translated as Pendidikan. This is good, but recently Education is translated as Pelajaran. Please look up in our Children’s Textbook, Pelajaran 1, is Lesson 1. So, the Kementerian Pelajaran, is the Ministry of….You now know. Ladies and gentlemen, we are too far away from the National Education Policy. Should you check the present implementation throughout from Year One to the University, using the National Education Policy as the measure, we are off target. So those who are at the University be watchful, and those who are here please remember, should some of us are no longer here, and this seminar 10 or 20 years later is organized by our children, let it not be the title of this presentation is Melaksanakan Keusahawanan Bagi Pihak Siswazah Menganggur, or Implementing Entrepreneurship On Behalf of the Unemployed Graduates. Another intellect, “You have send a very powerful message”. In addition I see the point I raised at the workshop about Industrialist, was one of the points highlighted, although it does not rise to be a resolution. Above all, the trainers are forming Symbiotic. A society and cooperative that cater for the well being of the trainers and service providers. I am one of the Pro-tem Committee. Perhaps more is expected…so let us continue to participate and contribute. Modules are needed now to translate the strategic plan into its practical operations. I already see one I am to proceed. 350 sons and daughters of this soil are invited by one of the Malaysian Government ministries to contribute to the way forward through a Strategic planning with the intention of developing a new group of a million entrepreneurs. In a country, a population of nearing 30 million, I am one of those who is invited. To invite everyone including himself, wife, children, family members, friends, fellow Malaysians, individuals & citizens of the world, on a transformation and be transcending to experience total success in this life now here as well as the life here after, by discovering, uncovering, and recovering the total information (ayats) within The Total Movie. Then, willingly submitting and surrendering totally to the God. This mission is supported by his lifespan search and research on every aspect of success & failure, and presenting the path toward order, through continuous self-improvements. I am now stand and sit ranking with the best individuals from various fields of intellect and outstandingness. I met a former classmate and a former university mate, who now are in the highest position in the government agencies. From the total, a minority I knew, yet a majority knew me. Perhaps from the television exposure I use to impact this nation earlier, with information beyond most thinking Malaysians. Here being treated like a sultan, grand seminar room, grand workshop venue, excellent food of abundance, great individuals, super class accommodation, and internet 24 hours. Wah! I now know, it has been goodness that I decided to go. “Thank you My Lord, all praise belong to you, the Lord of the worlds”. I am here in this invitational task force, as a Principal Consultant to TORE Network Consult Sdn Bhd, and a Business Management Consultant for MARA. “We are opportune to have a Government, and this Ministry is the nerve center. I can accept the logic of a company borrowing money from the Government, but beyond me is a country borrowing money from a company. This country cannot be less than richest to all companies combined. First put first point first. Let us defined or else be defined. Agriculture for example is Pertanian. When we celebrate an Agricultural Day, the Petani accepts, not the Peladang, Nelayan, or Perternak. Similarly, Industry Industrialist Usahawan. Business Businessman Businesswoman Peniaga Peniagawan Peniagawati. Entrepreneur is not Usahawan. Entrepreneurship Entrepreneur is Usahaniagawan. Please be sure when we talk about Entrepreneur and Usahawan, we are speaking the same language. So as to benefit from this gathering. Look at the farmer who plants coconut, earns 10 cents, the one driving the lorry to pick this coconut from the village to town earns 60 cents, and the retailer to the consumer earns 30 cents. So if we are here in this workshop focusing on developing Technopreneurs, were are really focusing a group to be earning 10 cents of 100 cents. Now please observe who is the leader in control of all the coconuts from the farm to the consumers’ homes. He is not farming, he does not drive the lorry, nor run a retail shop, and yet he is the King of this nut, yes coconut, earning the most. Okay quite a speech eh? Yet, the one empowered is always the one who did not get the message. I am already here, the God willing, with this mission, as an invited Consultant, I shal persist and pursue. Please help me my Lord. I am registered at Technorati. I joined on Apr 09, 2007. Observe how I play a role in improving other bloggers a bit improve their Blog Page Ranking, Authority, Blog responses, and number of fans at Technorati. 03. An individual or a group of individuals who aspire to enter into a mutual win-win benefit based on a common interest. ziki.com Want to know all about me? Check my homepage here. I remember earlier it was 500. Zubli Zainordin is my name. How many in the USA having this name? There are individual searchers for information, and when the information they are searching and researching I have documented, we shall be in Synchronicity. shueqry is featuring me at his blog page. Maurica…hi marzie, welcome to my blog.. yeah, i just follw my heart..zubli indeed a two-thumbs-up motivational writer. Dalam artikel lepas saya telah berkongsi dengan Anda artikel dari Zubli Zainordin, seorang penulis pembangunan diri saya bagi saya setanding dengan nama-nama penulis dan motivator ‘otai’ lain di dalam negara kita. Saya tak tahu kenapa saya minat dengan stail penulisannya, saya cuma ikut kata hati. Dari apa yang saya bandaingkan dengan penulisan dari motivator lain, Zubli Zainordin mempunyai gayanya yang tersendiri, sedikit melucukan dan santai. Tiap kali membaca artikel karangannya membuat saya gembira dan timbul banyak idea. Tak perlu pakai headline, sekali baca dah tahu itu artikel karangan Zubli Zainordin. Dia seorang yang unik dan luar biasa pada pandangan mata saya kerana melihat apa yang tak nampak, terutama konsep ‘Total Happines’ dan ‘Syncronity For Change’. Saya sungguh kagum dengan beliau, sekagum saya pada Andrew Matthews dan Steve Pavlina. En. Alias Haji Muda berminat menulis sejak awal 1980’an menggunakan nama pena Alias H.M. Pandangan-pandangan beliau ketika itu mengenai pendidikan pernah tersir di akhbar-akhbar Berita Harian, Utusan Malaysia, Majalah Mastika, Dewan Masyarakat dan Dewan Budaya. 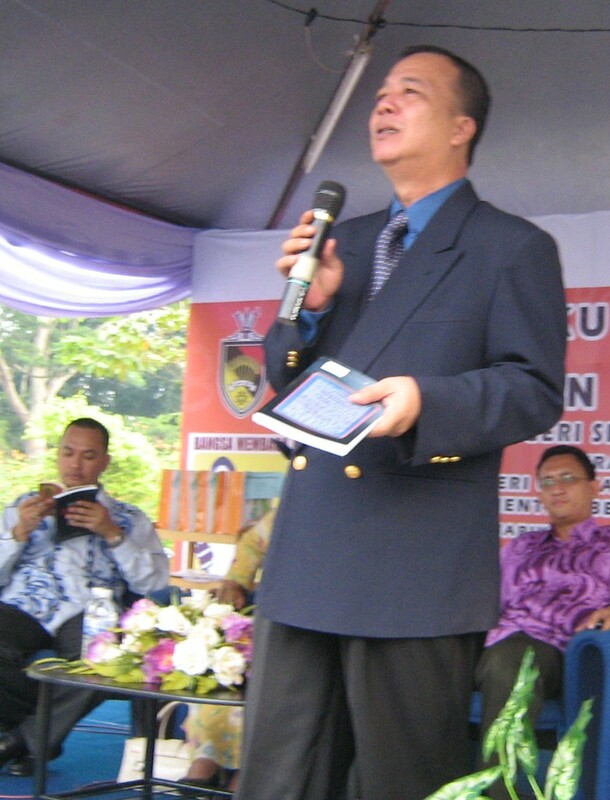 Encik Alias adalah ahli berdaftar Malaysian Association of Professional Speakers (MAPS), memiliki Sijil Kejurulatihan Program Bina Negara (1993), Sijil TNA MARA (1997), Sijil TOT LPU MARA (1998) dan Sijil TOT MARA (1999). Pernah menjadi panel temuduga/panel forum /penceramah /pemudahcara /penyelaras kursus-kursus keusahawanan SUS, LAP Kakitangan Kerajaan, PUM pelajar anjuran Kementerian Pembangunan Usahawan, kursus-kursus keusahawanan MARA seperti PUTEK, Program PUTRA dan lain-lain serta kursus-kursus keusahawanan KAKS untuk beberapa buah IPTA. I am not here earlier. In total hiding. Almost considered mad. Yet I am not. Just. I am a constant and a consistent searcher. Now I am here, yet pretty much still in hiding. The real me what is there to tell, and what is there to know. This blog, provides a bit of an answer, but all are labels, yeah good labels about me. Position here for my future generations who prefer to know me. Well individuals in the public can also check here should they also prefer to know me. My life is a full series of ups and downs. I did not understand this earlier. Now I do. So. Ups I enjoy to the fullest. Down I learn to the maximum. For, every adversities, it has been said, contains the seed of a better or an equivalent benefit. So those who know me throughout the earlier continuum of my life, yes, each can reveal me naked. Yet, I am now surely different from the me you once know. Self improvement and continuous improvement is the ways I journey and voyage this life. I nak jadi orang yang baik, itu sahaja. I prefer to be a nice individual, that is all. It is surprisingly easy actually to be known within this bloggosphere. I have a Google.com, gmail address, set up blogs at wordpress.com, Join MyBlogLog.com, park at every conceivable portals within the bloggosphere, and thus be known. As I proceed moment by moment there are already individuals interested to know, who is Zubli Zainordin. Each has come very close to point, this is you! Earlier I built walls of personality, then character, then more walls. These are purposefully meant for each of them to keep on guessing. None, thus far, has been able to penetrate and discover the real me. Until, one lady appeared and bang bang bang. Right and correct on all counts. Next more are reading my writings and republishing them at their blog pages. My name mentioned at their blog pages. Individuals who accept me as their friend. Awards I begin to receive. MyBlogLog team members frequent visits. Interviews are lined up. In Synchronicity, in Connection, in interaction, and integration….Okay, now I am ready to be known. I have thus far received two certificates as I have been quite regular with donating blood. I started in 1987, after seeing blood from an or Australians dripping into my second child, at Camper Down Hospital, Sydney, Australia. Ever since I donated blood. I have heard excuses by individuals for not donating. When I checked, all these excuses has nothing to do with blood donation. Much earlier I wrote a script, direct it a drama, and even acted in it, *My Wife is Your Wife*. Why do I do it? One, a kind of pay back, and a thank you to blood donors to my family member. While in a giving position on the hospital bed, and squeezing this plastic bar, I pray that some individuals shall get the best of a part I am giving. Yeah, a universal donor. Born with it. Shall I continue to do this? Yes, but not for the certificates. If they give, I take and keep. That is all. Giving is always good. The goodness is, my body then produces blood to fill up the basic amount as the requirement for me. Fresh. The individual who donated blood and being used earlier by my son, do not even know us. Neither do I know to whom my blood goes into. I prefer the recipient will then carry a bit of my character once blood has been received. On a serious note, after blood donating, I feel good inside, not easy to describe it with words. You do it, you shall know. I say, once, at least, do it. One of expertise is Team Building. I have introduced an entirely different course that have made the differences. This training is interesting because I am on a flight to Sarawak and then Sabah. Departure is Saturday 07.07.2007. I shall be back in Rawang bu the 14.07.2007. Since a young age I love to be on a flight. Airplane fascinates me. After believing in Real Magic and knowing trigger, I have been on many flights local and abroad. I have accumulated personal strengths over the a life span. I understands fully the power of synergy – the clear mind, purity of the heart, delightful spirit, and more. These, and the relations to developing huwman potentials. I always put a priority between a company’s vision, mission, objective goal, and my personal. I am willing to go the extra mile in serving any company or an entity larger than self. I am able to work independently with minimum supervision. I am an influential leader and a good manager in leading, planning, organizing, motivating and controlling. I am also also a team player; an able leader and a supportive follower. I have been involved in management and organization, and I am able to adapt to any environment. I shall fit in nicely as a good leader or follower in any given team. I continue to be responsible and accountable given an authority. I complete my tasks on a point of a continuum agreed upon, with quality assured. I am able to brighten up any office and surrounding environment as well bring cheer to the staff. I am open in my outlook of life. I have always focused on the up-look. I am a thinker who is outside the box. I am good at communication both in speech and in writing. I have been a professional master of ceremony, and, an professional and a popular public communicator. I am highly motivated, cheerful, totally happy and able to share the motive in motivation of self and others. I am knowledgeable, having exposed to information and education since the sixties up to the highest level of education. I have the ability to understand and apply this given knowledge. I can relate interpersonally with anyone and any race. I am friendly and relate very well with people of various ages. I am normally humble but assertive. Especially I am proactive. I am continuously improving myself especially in my skills, attitude and abilities. I aspire to be a better communicator in English as well as Malay Language. I explore new frontiers and constantly learning new areas, subject, and topics. I am willing to experience new challenges, although training and teaching is my forte. I dress for the occasions. My hobbies include reading, writing, educating, teaching, training, facilitating, moderating, counseling, researching, traveling, selling, marketing, outdoor adventure, internet surfing, and also an individual request with a question I am in a quest and conquest of the unknown territories, extra dimensions, and the new frontiers. At present I am building an e-community at MyBlogLog, and I have positioned 3 blogs here, to achieve such a responsibility.